Brainstorming is a valuable tool and has an almost endless number of uses: collecting user requirements, developing mission statements, establishing rules of group behavior, and conducting post-mortems—just to name a few. The process works well in all setting including: corporate, government, and non-profit organizations. Facilitating a good brainstorming meeting is not magic. It is a matter of following the process. 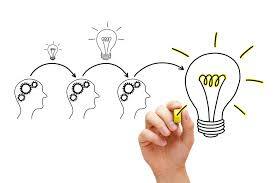 Two principles contribute to success: First, separating idea generation (creative) from idea evaluation (analytic). Second, minimizing discussions that lead to group think, stifles participation, and bog down the flow. We want participants to be actively engaged, so we want to create a positive experience from the start. First, find a good space for the meeting. A well-lit room with a lot of wall space is preferred. The meeting should be no more than 2-hours long and an hour is often sufficient. The best time to hold the meeting is first thing in the morning or immediately after lunch. Studies show that our brains tire in the late morning and afternoon. Order refreshments. Light snacks can counter brain fatigue. Assess the space. Participants need tables to write on. Configure the seating to create a collaborative environment. We will be putting Post It® Notes on the walls, so test to see how well the notes stick. Many conference facilities have fabric coverings and notes often flutter away. One option is to tape large flip chart sheets to the wall. Before the workshop, follow up with key participants. Ensure they will attend the meeting. If participants need to be briefed or require special attention, talk to them before the event. For example, if one of the participants is habitually critical of other people’s ideas, ask them to reframe from commenting by explaining that this stifles creativity. On the day of the workshop, be prepared. Set-up the room beforehand. The facilitator and workshop sponsor should greet people as they enter. Create a welcoming environment. Post-it® Notes: Use the super sticky, basic yellow, 4”x6” size for brainstorming. Plan for least 10-20 notes per participant. Sometimes it is helpful to also have a large-sized note pad. too. Post-it® Easel Pads or flip chart paper: Easel pads are good for capturing: parking lot items, rules of engagement, summarizing findings, etc. Black, fine tip Sharpie® or similar pen: The black Sharpies pens provide high-contrast on the yellow Post-Its®. Have one pen per participant. Painters or masking tape: You never know when you need some extra stick or need to hang something up. Dots or Stars: We will either use colored dots or stars for voting preferences. Candy: Bring a bag of bite sized candies. Little toys: Bring some small toys like Koosh balls, foam balls, pipe cleaners, etc. They help with the creative process. The facilitator plays a critical role. The facilitator keeps the meeting on track, ensures that the group is following the process, and keeps the participants focused. The facilitator should not also be a participant. Their role is to govern and manage the meeting. Avoid having the facilitator be the manager or someone with formal, organizational authority. Having a manager facilitate may dampen open engagement. Brainstorming is creative process. Design an event that breaks down the strictures and structures of the business environments. Have candy and small toys on the tables for participants. A small shot of sugar can stimulate brain activity. Adults love having something to fidget with. Have fun, lively music playing in the background when people walk into the room. For introductions, have people silently line up based on something—years of experience, years at the company, distance to the office, anything. The idea is to get them up and out of their seats. Standing introductions go more quickly. Have a quick, fun icebreaker question. What is the objective of the meeting? Setting the objective and scope are critical. Everyone to be clear on why they are there and what “done” looks like. If the scope needs to be defined or refined, take a few minutes to clarify. On a flip chart, draw a line down the middle of the page and label one column “In Scope” and the other “Out of Scope.” Have participants suggest items. The facilitator or sponsor can indicate whether those items are in or out of scope. Topics that are important, but out of scope for this session, Should be put on the “Parking Lot” list to be addressed later. How the meeting will be conducted. The format of the meeting will be new for most participants. Quickly tell them that you will be using structured brainstorming techniques and most of these processes will be performed silently. Explain we are using this approach because it has been proven to be successful. Don’t provide too much detail, just let them know it will be different. Remove electronic distractions. Laptops, tablets, and cellphones are distractions. Ask participants to put away their devices. I like to cite a poll by the Pew Research Center showing that half of respondents admitted to bumping into something while distracted by their phones. Set ground rules. Establish the rules of acceptable, normative behavior. Focus on positive behaviors. I like to ask participants to be engaged, creative, and open minded. Explain that brainstorming is a creative and divergent process. The goal is to generate as many ideas as possible. At this point, quantity is more important than quality. Each idea should be written on its own Post-it® Note (card). Leave their electronic devices alone. Read the ideas. Ask the participants to read their ideas out loud. You can start anywhere in the room. Have participants read one idea then continue around then room. Keep going until all ideas have been shared. Post the idea on the wall. As the participants read their idea, post them on the wall. Ideas should be placed randomly. They should look like a cloud rather than linear rows and columns. If there are duplicate ideas, place the cards next to each other. Generate new ideas. During the recitation process, people may get a new idea. Have them write a new note. The sharing process engages the auditory and visual senses and gives people the opportunity to move around. We want to minimize side conversation and comments during this process. If a leader or manager is in attendance, have them share their ideas last. This reduces the likelihood of bias. If there is a need for anonymity, have the facilitator or volunteer collect, read, and post the ideas. Once all of the ideas have been posted on the wall, invite participants to organize them. Organizing is convergent process that accesses our analytic thinking. Suggest that they start by finding 2 or 3 cards that have a common theme and put them together. Increase the number of associated cards until all of the ideas have been put into a group. Depending on the number of participants and ideas generated, you may invite small groups or the entire team up to the wall. Duplicate cards can be put on top of each other. If additional ideas are generated, they can be added. Once all of the ideas have been organized, we will label the group. The facilitator reads down list and then asks the participants how the column should be labeled? What is the common theme? Distinguish the label card from the others; use a different color, size, or draw a border around the card. If one of the cards does not seem to fit in the group, then move it to a group that is better aligned. If need be, create a new group. The group will have generated a lot of ideas. Now it is time to filter and prioritize their work. We will use the “dot” or “star” voting technique to rapidly identify and prioritize the ideas. Voting is conducted silently. The facilitator gives each participant 3-5 dots or stars, then instructs them to vote their preference by placing a dot on the card that is most important. Participants can either spread their dots around or concentrate them on one card if they have a strong preference. Once the participants have placed all of their dots on the cards, the facilitator summarizes the results. Start with the ideas that have the greatest number of votes (dots). Read the idea out loud. Then ask the group if the idea is clear. If not, take the opportunity to revise the card. The facilitator should focus on ideas where a strong preference has been displayed. They may not need to review cards with just a few votes. Depending on type of event, participants’ energy level, and time remaining, the facilitator may choose to synthesize the results with the participants. Quickly summarize the objective of the brainstorming session and review the outcomes.Ask participants if they objectives have been met? Ask if there is anything else, of significance, that needs to be added? Review the parking lot and ask if these items still need to be addressed? If so, then a follow up meeting should be scheduled. Describe future expectations of the participants. For example, the participants may be asked to review the notes summarizing the outcome of the session. THANK the everyone for their contribution to the session. Thanking the participants helps create a positive lasting impression. As the meeting adjourns, the facilitator should linger in the meeting room to address any individual questions. After the room has emptied, the facilitator should preserve the flip chart sheets and idea cards. Take down each of the cards within a column and stack them with the category card on top. Appendix with all cards listed along with the number of votes received. Often, the meeting summary is sent to the participants for their review. The review is a “cold wash” where participants have the opportunity to contemplate the outcomes.